Why You Should Buy a GPS System For Your RV? Navigating around with your recreational vehicle and finding directions can be hard without the best RV GPS. It’s a special recreational vehicle device that eliminates the hassle of being lost or being unprepared for traffic. That’s not all because this navigator can help you find directions using maps and popular places using the database integrated into select models. These GPS systems also save your phone battery, add driving safety and are easy to install. However, there are many GPS systems on the market now, and it make things a bit complicated if it’s your first time to buy the navigation system for your vehicle. For this reason, we’ve put up this guide to help you find out what to look for and top picks in the category. If you’re ready, let’s start navigating around for the best RV GPS systems now. 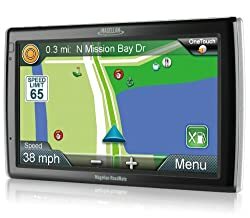 The top of my list for the best RV GPS is the Garmin 770 GPS because of its solid features that make it the most reliable navigation system for the recreational vehicle. One thing I liked about it is its large display 6.95 inches, which make it easy to read information while on the road. I also love the custom RV routing it can provide us based on the weight and size of our vehicle or towable trailer. 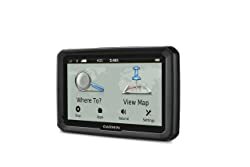 With that said, the Garmin RV 770 NA LMT-S is also a versatile navigation system that can be used in other vehicles, such as trucks, travel trailers and cars. Plus, with customizable settings, you can be certain of its accuracy when it comes to giving you precise information you need. As it is also featuring a hand-free operation, I can keep my eyes on the road, keeping driving safe. As I don’t have to touch any part of the screen, I can also be sure that I can focus on driving to prevent accidents and injuries, which might happen if I am distracted when using the GPS. In addition, another great feature it has it its voice activated navigation that adds to safety and convenience of use. The voice control responds to the commands so that we don’t need to touch any parts of the screen when trying to know about specific information. It also offers smart notifications that we need when on the road, offering us with convenience and ease of use whenever we’re traveling and navigating especially in unfamiliar locations. In fact, this model also features free access to basic weather and live traffic, two basic things we need to keep updated with for when driving. Plus, it comes with an integrated Wi-Fi connectivity for software updates and easy map use. There is no computer needed! The GPS navigator from this brand is one of my favorite. Just like other Garmin models, the 760LMT portable GPS system is one of the most reliable. I love its big display 7 inches, allowing us to view information that we need without any hassles in a screen, which also works in low or high sunlight conditions. Another great feature that I would like to recommend the GPS navigator for is the customizable routing, which can be adjusted based on the weight, height, length and width of the tow trailer or recreational vehicle. It also informs and gives advisories and cautions, including lateral wind, sharp curve, narrow road and state borders, to name some. This model also works based on voice command, letting you use it hands-free. You just have to talk to it, and it will respond to your voice commands. One more thing I liked is its versatility to work with a BC 20 backup camera. 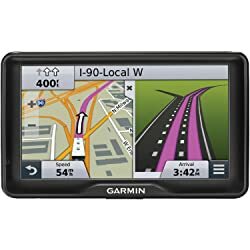 Another car navigation system that I recommend for the recreational vehicle is the Garmin RV 660LMT. While it has a smaller screen versus other Garmin models, it is big time in features and functions. For one, it lets users change their route to have their preferred cities or road with a simple touch of the screen. With a customizable setting, we can be sure that we’d get to our destination easier and faster. I would also like to note it offers custom RV routing based on the size and weight of the vehicle. Such a feature lets us take advantage of real time and accurate alerts, including low bridges, sharp curves and other things that might affect our safety. Informing us of these the lie ahead, we can drive safer. It is necessary when navigating the roads to prevent injuries and accidents. It also features RV services and parks, allowing users to search different results based on the filters used in searching. I would also like to note that it offers road cautions and warnings, including weight limits, steep grades, sharp curves and bridge heights. Another GPS navigator system to consider when finding a reliable RV navigation device is the Garmin dēzl 770LMTHD. I cannot help but notice how excellent and smart the model is when it comes to offering us with accurate and quick updates about what we have to know when driving. It is also built in with a feature that offers trailer and truck services directory, allowing us to look for stops by amenities or brand names. In addition, it is helpful regarding helping us look for popular and more shops and restaurants through Foursquare. More so, you would like that it offers custom routing based on your truck’s weight and size. It also features logging of hours of service, maintenance and fuel use, to name some. 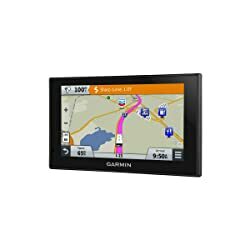 These are additional functions that make the Garmin dēzl 770LMTHD a smart choice when it comes to RV GPS systems. It is a sure value for the money that makes this model a top pick among RV owners that want to take advantage of a complete navigation system for their recreational vehicle. Finally, it offers free lifetime maps and traffic updates with no monthly subscription. With this feature, we can save money in the end because we don’t have to use the data plan of our cellular phones in order to check for traffic updates or find directions. 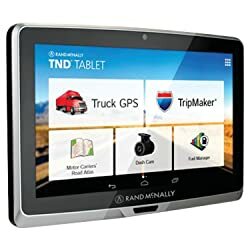 The Rand McNally TND530 is a top contender for the best RV GPS systems on the market because of ease of use and accuracy. Another solid feature that you will love about it is its interface options, carbon and ice. It also has a commercial bus routing option, which lets you use it for a bus or any other larger vehicle for that matter. One thing I also love about the Intelli Route TND 530 LM is its customizable routing based on the weight and size of the vehicle. With that said, this is a versatile unit that lets us transfer it from one vehicle to another. It is also lightweight and portable, which adds to its ease of use. It also lets us search for popular places and centers by amenities. With such feature, we can look for specific destinations and interesting spots where we can take our loved ones to anytime we’re aboard our recreational vehicles. This model also sends out advisories and warnings, including a complicated intersection, making driving safer. With cautions and alerts we can receive, we can be informed ahead of time and prevent accidents and injuries while navigating the roads and highways. So when it comes to safety, we can depend on the Rand McNally TND530. If you’re shopping around for a dependable and durable GPS system for your RV, you might want to take a second look at the 528013076. It is made of durable materials that withstand shocks and vibrations in the RV. In addition, this model has a larger display than other GPS tablets, measuring 8 inches to let us view information easier. With a larger screen, it will be easier for us to read information in real time. 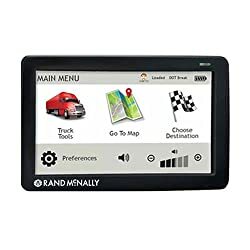 Especially for people having trouble reading on smaller screens, they can rely on the Rand McNally GPS system that allows them to check for updates with ease. Another thing I would like to recommend it for includes its integrated dash cam, which makes it a great value for our money. That said, it is like purchasing two products in one, saving us not only money but also time for finding a dash cam compatible with the GPS system. One more that I would like to note is its logging features and trip planning tools, which make it really handy to have aboard. These additional features make the unit a great value for money. These are additional functions that can also give us an easier time when planning for our trip. Overall, this unit is one of the most reliable choices around for its top performance and solid features that make it a top pick in the category. It offers convenience and cool functions that can give us an easier time when navigating the roads, especially in unfamiliar places, for its accurate navigation system. Are you looking for a smart and innovative GPS device for your recreational vehicle? 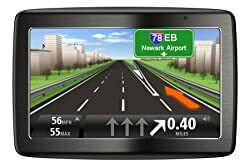 One of those I found to fit the criteria is the TND 70 GPS, a great navigator for the RV owner and professional driver. It comes with the complete features and capabilities of the IntelliRoute TND truck GPS system that you will appreciate. This model is a smart GPS device from this brand, which is known for its reliability in the RVing world. I would also like to note that it comes with the preloaded apps for fuel manager, document imaging, load board and accounting. These additional features make the TND 70 GPS a top contender for the best GPS systems for trucks, cars and mobile homes. This model also comes with an on-board dash cam, which works compatibly with rear view or backup cameras. It is one of the great features that I would like to recommend the TND 70 to other RVers looking for a reliable GPS system for their vehicles. Finally, you will appreciate that it offers access to different apps, including email and music. This quick and easy access makes the unit a top choice for modern RV owners that would like the convenience of accessing their favorite apps for productivity and entertainment, to name some. 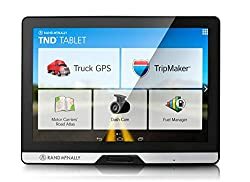 Overall, the Rand McNally TND 70 GPS is a decent choice for the navigation systems to find on the market now for its innovative and compact features. You might want to take a second look at it if you’re looking for a complete RV GPS navigation system that can also last longer for its durable materials and great design profile. One of my highly recommended GPS systems for the recreational vehicle is the TomTom VIA 1535TM. It offers smart features for improved safety, just like the hands-free operation that it has. This feature keeps your hands on the wheel, not on the device because it does not require touching or tapping. Safety on the road is a top priority among RV owners that want to prevent accidents and injuries on the road. When shopping around for a navigator, you should look for this safety feature to ensure that you will be able to drive on the road with not only ease but also safety. It follows and responds to your voice commands. With such feature, you don’t have to touch the screen when trying to find information. The only thing you need to do is to speak and the voice control will be able to respond to your commands. The model also includes map share technology and maps with IQ routes, improving ease of use and safety. The TomTom VIA 1535 TM also makes use of Bluetooth technology for hands-free calling and advanced lane guidance for knowing the way to go beforehand. If you’re shopping around for a GPS tablet and navigation system with a larger screen and smart features, you might want to take a second look at the RV9145-LM with a 7-inch display for easy and quick viewing of information. This model also features the OneTouch Favorites Menu, letting you personalize your navigation and road experience while having quick access to favorite searches and destinations. And based on your recreational vehicle’s profile, the model offers customizable routing. With this feature, you can have peace of mind that you will get accurate updates and alerts when driving. It also makes the unit versatile to be used in other vehicles other than you recreational vehicle. In addition, the 9145 offers multi-destination routing for planning your trips in advance to save money and time. Using this feature, you can also plan to go to different destinations in less the time because you’re able to customize your route ahead. It is one of most valuable features of this unit that makes it a top contender for the best RV GPS. Finally, it has the Exclusive Good Sam Trailer Life Directory, which is preloaded, for more convenience. The Good Sam GPS RVND 7735 LM should not be missed on this list of the best RV GPS. It is loaded with top and smart features that makes it one of the handiest to have onboard for safe driving. 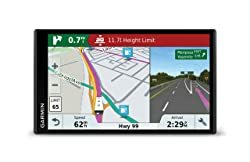 This model offers safe and easy navigation even for large vehicles for its HD screen and clear color and text display plus a realistic map and accurate road maps. It is one of the most innovative around for these modern features that every RV owner will appreciate. The Good Sam 7735 LM GPS is also loaded with directories for searching more 8,000 RV parks along with 2,100 Good Sam Parks. I also liked the display that works well even under low or high sunlight conditions. It is an excellent performance feature that gives us an easier time in reading data we need. For routing, it can be customized for cars and large vehicles, making it a versatile choice to use for other vehicles. Finally, it allows connecting to Wi-Fi for fuel prices and weather updates. 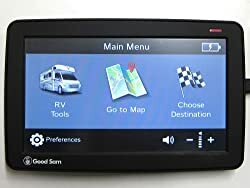 Overall, the Good Sam GPS RVND 7735 LM is a cool option if you’re looking for these solid performance features and functions for your recreational vehicle’s navigation system. You might want to take a second look at it. Before shopping around for a good RV GPS, you should know the different types available because it will affect your satisfaction of use of the specific kind to buy for your vehicle. That is why aside from the price, features and functions, you must also know that there are certain types of GPS systems on the market to choose from and use in your recreational vehicle. Three types to discover in the following are the street navigation system, sports GPS system and handheld GPS systems. To know more about each type, keep reading and later figure out the right one based on your needs. Once you start driving your recreational vehicle, you should have an assurance that you won’t get lost and out of track. Or else, you will be losing much time and waste fuel. For this reason, you might want the street navigation system that has the ability of providing you with turn-by-turn directions and instructions such as mileage, speed and arrival estimated time. Many of these systems are integrated with US maps and can be upgraded with international maps. Another thing that makes it the top choice is that the unit is highly programmable. It can offer you information about your favorite stops’ locations. In addition, they may have the ability that can interface with your mobile phone especially if you want a hands-free operation. For the RV owners that want sports, they opt for sports GPS system. It is an ideal navigator that works for the sports fanatic recreational vehicle owners. You might also want to choose this system if you want to use an advanced device that has marine features, something suitable for sailors. Some of these units can also come with a compass, which is one of its best features. A few units that come as a GPS watch sometimes can work as a mini computer that can offer plenty of features to meet your needs. So if you think these things sound good to you, you might want to choose the sports GPS system that offers more than just a precise direction or safe navigation on the road. But remember, choose the right model that comes with all the great features you’re looking for to find what works best for you. The handheld GPS is another type of navigator to invest on and use for your RV. It can be for you if you’re looking for a more convenient system to use while driving on the road. It is one of the most useful tools to have if you’re looking for a modern and sleek device that can offer you with convenience and safety while navigating the roads with your RV. This unit can also be used as a replacement for a map and compass. Many of the best ones are also loaded with smart features, such as digital maps, precise locations and information like topographic details. The handheld system also allows the access to waypoints, which are ideal campsites, fishing sites and safe passages. In addition, this system also works wonders when it comes to improving your safety outdoors and reducing your chances of being lost in a very unfamiliar location. These types are also reliable when it comes to supplying you with data of a precise position that can be easily relayed to a rescue team in times of an emergency. There are certain things to look for when buying an RV GPS. Remember, investing on one isn’t an easy to decision to make because there are many available choices on the market that might cloud up your mind and that could give you a hard time to decide which one truly suits your situation and needs. That is why you should know the considerations to make before buying this device. After all, using this unit on your RV should not give you a hard time in navigating the roads. Plus, it must be able to offer you with useful features, such as apps for the weather, music, entertainment and emails. Some of these also offer live weather and traffic updates, which come free for a lifetime for many of the products available in the category. To learn more on the things to look for when buying the best RV GPS, keep reading in the following section for a buying guide. Screen: Why does the screen matters? There are certain reasons the screen is one of the top considerations when shopping around for the right GPS system for your RV. Many of the models available are between five and six inches, which can be ideal for a handy tablet navigator that offers quick and easy viewing of needed information. On the other hand, there are bigger screen models including those with seven or eight inches of a screen display. While they appear bulkier than smaller GPS tablets, they can be ideal for those who are looking for a bigger screen that offers an easier view of information especially people with vision issues. The screen is also a vital factor when choosing a good RV GPS because this part is what we’re going to interact with in the first place. The screen should not be just large enough but also bright enough for low or high sunlight conditions. Such is dependable especially that one with a poor screen display might give us a difficult time in reading vital information while driving. That is why we must also find a GPS system, which screen works well in different lighting conditions. The screen should also be easy to use and responds well to touch when trying to customize the settings before hitting the roads. It should also display vital data in real time so that we can keep track of traffic updates and weather changes from one location to another. With a bright and good screen display, we’ll also be able to navigate with safety because we don’t have to look closer to the screen just to read or view data, for instance. Voice Control: One of the most innovative features of new GPS systems for cars, trucks and recreational vehicles is their ability to keep up and respond to voice commands. It is a great safety feature integrated on the latest models like those we’ve featured in today’s reviews. With the voice control feature, we don’t need to have a physical contact with the navigator because it just needs us to send out voice commands that it will then pick up and respond to while we’re driving on the road. Through the voice command feature, we can operate the unit hands-free, meaning we can operate it without touching the screen. Choosing a unit that has a voice command feature, you can improve road safety because you can drive without distraction. You just talk and the device will work for you. Live Traffic: Another top consideration to look into when finding the best GPS system for the recreational vehicle is its live traffic update. I know this is a no-brainer to know why. But as you know, knowing about the traffic situation in advance will give us an easier time driving. For one, we can readjust our route so that we don’t become stuck in traffic if other alternative routes are available to get to the campsite or RV Park. With a real time traffic update, we can also reduce stress levels because we can get to our destination faster using our GPS device that can offer accurate information regarding the traffic situation. In short, we should find a GPS system that offers real time and precise traffic updates to keep us informed while navigating the road. Without the RV GPS system, you will find it hard to navigate the roads especially unfamiliar ones that you’d drive in the first time. It will be a hassle to stop or pull over very often to ask people for directions because doing it will be a waste of time and a stress on your part. But with a GPS system on your vehicle, you can experience the convenience of having a precise device that will help you create a custom route and find shorter routes in real time. Aside from these things, let us talk more about the benefits of installing a GPS navigator for your RV that you should not miss. Safety Factor: You should buy a navigator for your RV because of safety factor. Having it onboard, you can experience a non-distracted driving because it allows hands-free operation. What does that mean? As you don’t need physical contact before you could use the device, you can keep your eyes on the road and drive. And with non-distracted driving, you can prevent an accident because you can focus on driving. Plus with the voice prompts provided, you can be certain of convenience of use, too, because it can respond to voice commands. You just need to speak and the device smart function will respond to you. That also makes a safer driving because the prompts might even be able to provide you with alerts and warnings about low bridges, sharp curves and heavily congested areas. With the alerts and warnings you get in real time, you can improve the safety factor when driving a large vehicle like a mobile home. The unit is also mounted to display data, not obstructing your vision on the road. Many of the best units also are having just the right size that makes it fit securely, while working effectively without blocking your sight on the road. Protect Cell Phone Battery Life: You definitely have to install the RV GPS on your vehicle if you want to protect your phone’s battery life. Without the navigator system, you might have to use your cellular phone when trying to navigate places and finding locations. Making your phone work as a GPS, your battery might need replacement often because its life might not be that long if it has to multitask for you. By using your phone for not only music, entertainment, emails, phone calls and other things, its battery life might decline. You can prevent this from happening by buying a specific GPS for your recreational vehicle. With it, you don’t need to use your phone for GPS, maps and navigation purposes. Using the GPS navigator, you don’t just save battery life but also your sanity! You don’t have to do frequent battery replacement and consume your data plan for using your phone as a navigation system. Bigger Screens: The best RV GPS models now have bigger screen like those that we have featured today. With bigger screens, we won’t experience difficulty when reading data on our unit. A larger screen that also has a bright display to work on a low or high lighting condition also saves us from worry about not being able to read information at night. Plus, many of the best models also have screens that offer great definition. With that said, RV owners can also look forward to a clear text and vivid colors. Innovative models can also work well on whatever lighting condition, daytime or nighttime. Easy Installation: It is another top feature to look for when it comes to finding the right GPS system because it will not give you a hard time in terms of setting it up. Some of the best ones I found are also plug_and_play. It just means that we can use it out of the box. I think it is one of the most important considerations to think about when finding a good RV GPS that works well for us. If it is easy to install, it can also be portable because we can easily transfer it from one car to another. With ease of installation also comes with accessories that come with the particular unit to buy. Many of those products we’ve featured today already have the accessories like a suction cup. Buying and using the best RV GPS, you can be certain of receiving benefits, including saving your phone battery, improving road safety and navigating through routes with more convenience and ease. To begin, compare and refer to the top picks we’ve featured above and use the buying guide we’ve highlighted to make an informed decision. Buy the best RV navigator system today!